An alum’s intricate moving sculptures are full of unexpected combinations—art and science, nature and technology, the material and the spiritual. Hale started making what he calls “kinetic sculptures”—sculptures that depend on the movement of their pieces for their effect. 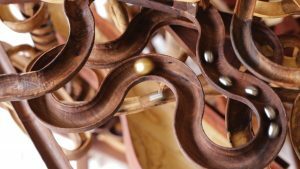 His art resembles traditional marble runs, but instead of using metal, which would be easier to shape and reshape, Hale uses wood for a more elegant aesthetic. He brought together a background in woodworking and his technical experience, which he employs to shape the paths of his sculptures on the computer before bringing the design to life. 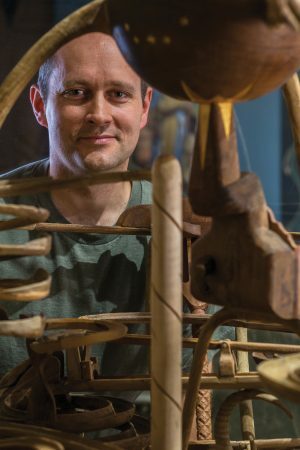 Karl Hale built his first kinetic sculptures using trees that had been removed during the 2002 demolition of BYU’s Smith Family Living Center. Photo by Bradley Slade. In the three years since he started, Hale has won awards at local wood-carving shows and his art has been displayed in the Springville Museum of Art’s Spring Salon, a competition designed to promote and highlight contemporary Utah art. One of his sculptures, Tell Me the Stories of Jesus, made it to the final round of the 2015 LDS International Art Contest. Many of Hale’s sculptures incorporate religious themes, drawn from the role faith plays in his life. “As I’m looking at lots of things in my life, . . . I often find myself seeing parallels or illustrations of eternal truth,” he says. He then finds ways to work those metaphors into his sculptures, expressing spiritual truths and scripture stories through the movement in his art. Marbles rolling through one of Karl Hale's kinetic sculptures. Photo by Karl Hale.